Generally, you should not try to bind RadGridView to a list of simple types. RadGridView internally creates columns and reads data for the properties of the objects it is bound to. However, the integer type, for example does not have any properties so if you try to bind RadGridView to a List of integers, you will get no data. 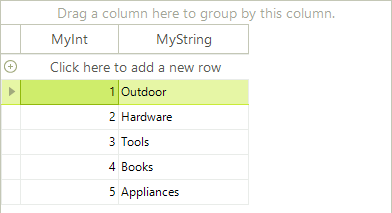 Following the same logic, if you bind RadGridView to a collection of strings, you will get a column representing the length of these strings, because the only property of a string object is the Length property. Generic Lists of objects containing bindable types can be bound to RadGridView by assigning the List to the DataSource property of the grid. The example below defines a MyObject class containing one integer and one string property. The next set of code snippets "Creating an List of Objects" creates an array of MyObjects, initializes the array and assigns the array to the DataSource. The MyObject class would typically be placed in its own separate class file and the List creation, initialization and assignment code might be placed in a form's Load event handler.